As digital technologies keep evolving at a rapid pace, IT experts are in great demand. The U.S. Bureau of Labor Statistics projects a 13% growth of IT professions between 2016 and 2026. That’s more than half a million new information technology jobs. And with the average annual wage of $84,580 (as of May 2017), the salary of an IT professional is more than two times higher than the national average for all occupations. And that’s definitely a goal worth shooting for, right? But first things first. The constantly evolving technical industry asks for your skills to be continually updated. And the same goes for your resume. If you want to score a cool job in a future-shaping field like cloud computing, big data or information security, having an impeccable presentation of yourself is a must. But remember, it’s not only about your technical prowess. A formidable list of all programming languages you know will never substitute for a well-structured resume that describes you as an amiable, well-rounded person. 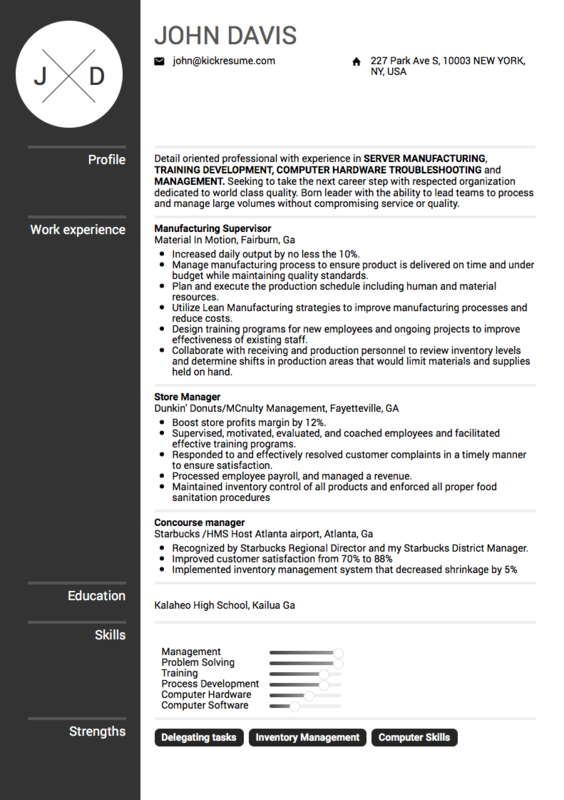 We’ve compiled 10 real IT resume examples that got people hired at some of the top companies in the constantly evolving technical industry. They can — along with our ultimate resume guide — help you succeed in competition and score a job you want, too. 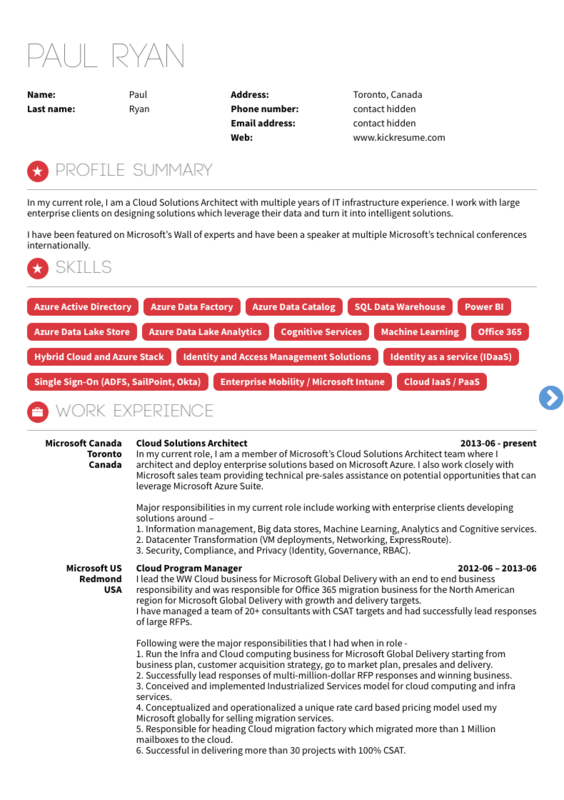 Let’s start our list of IT resume examples with one of the biggest companies out there. 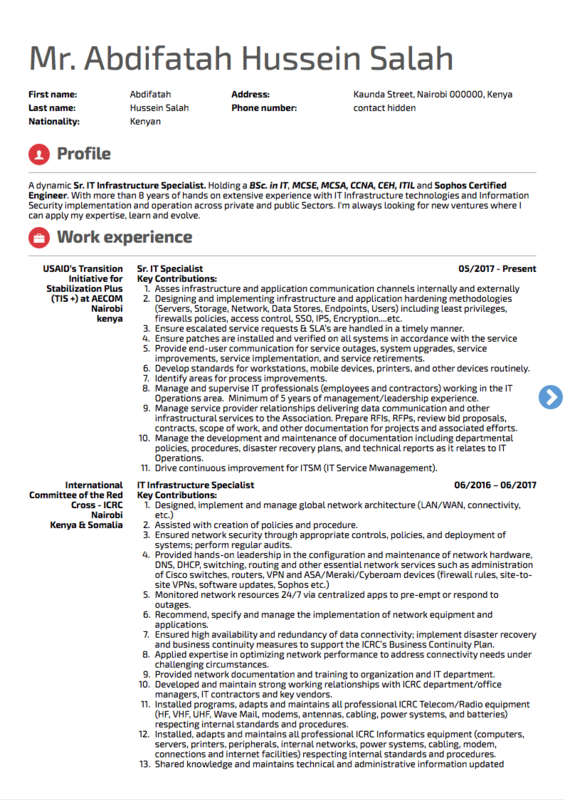 This resume examples shows that a good career document can help you land a job for at the world’s #1 cloud vendor in a field that’s redrawing horizons of the IT industry. 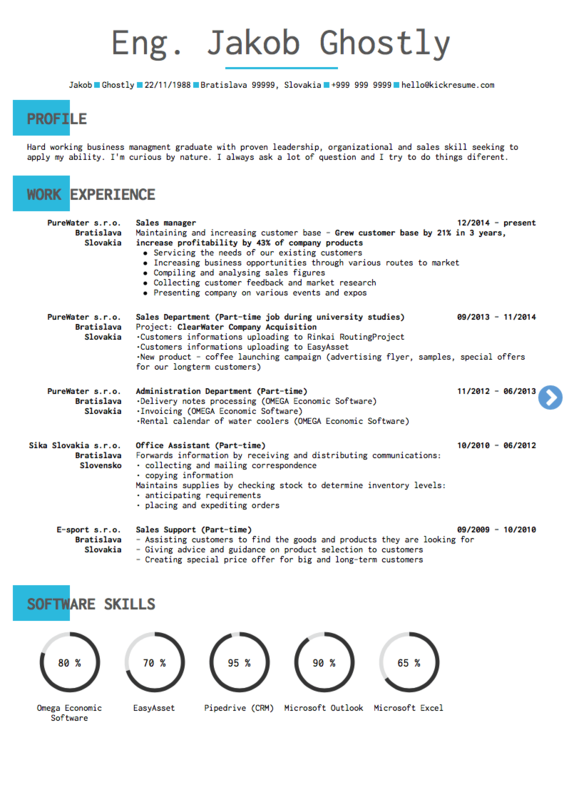 The following resume relies on a packed skills section but doesn’t fall short of giving priority to a short personal statement. It’s the best way of making a good first impression through a small and easy-to-digest paragraph. Also, take a look at the dominance of powerful action verbs in the Work experience section. Being a great way to start the sentence (leaving out the subject), they get straight to the point and illustrate responsibilities and achievements of the applicant right away. People usually read resumes from top to bottom. So it’s important to bring the top section of your resume to perfection to make a lasting first impression. Listing not only what you’re offering but also what you’re searching for can help the employer see you’re up for a lasting professional relationship. In fact, nothing compares to a happy employee when it comes to productivity! If your Work experience section speaks of your qualifications and achievements better than the list of your programming skills, move it to the front. Also, notice how more recent jobs get more attention than older ones. Especially for senior positions, it’s very likely that hiring managers will be interested only in the 3-4 most recent jobs you had. There’s simply no denying the French have style. 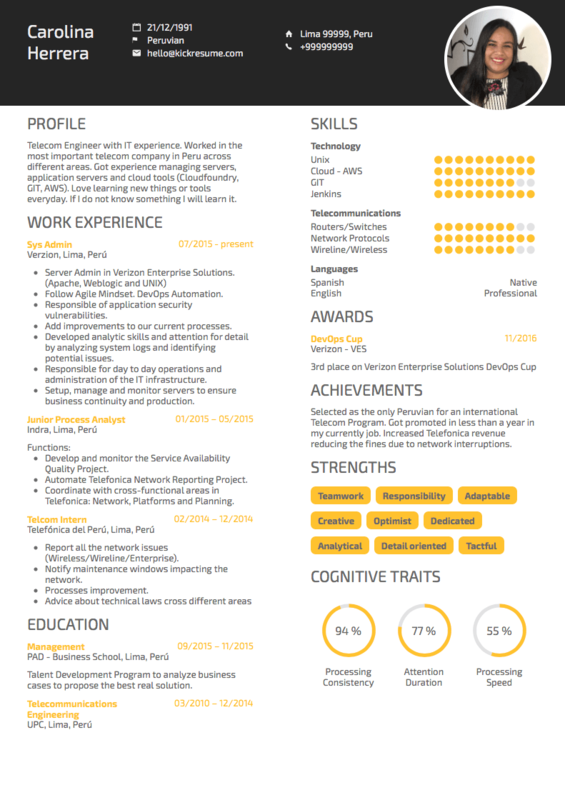 The elegance of this visually appealing resume makes it stand out from a pile of average documents on the HR manager’s desk. 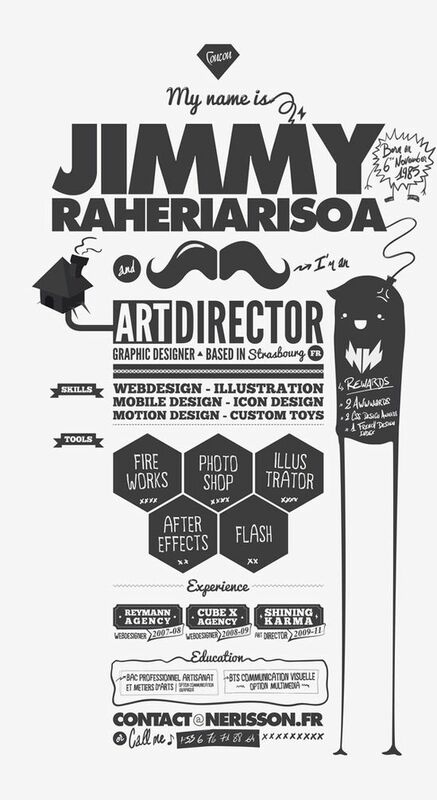 There is a number of suitable graphic elements that helped build an easy-to-navigate resume. You can get inspired by icons that represent individual sections, stars that evaluate your programming skills, labels that pin down your strengths or bar graphs that can describe your soft skills. You can populate your resume with virtually anything, but always remember to strive for consistency. Your resume needs to look coherent and make a decent first impression in the first place. 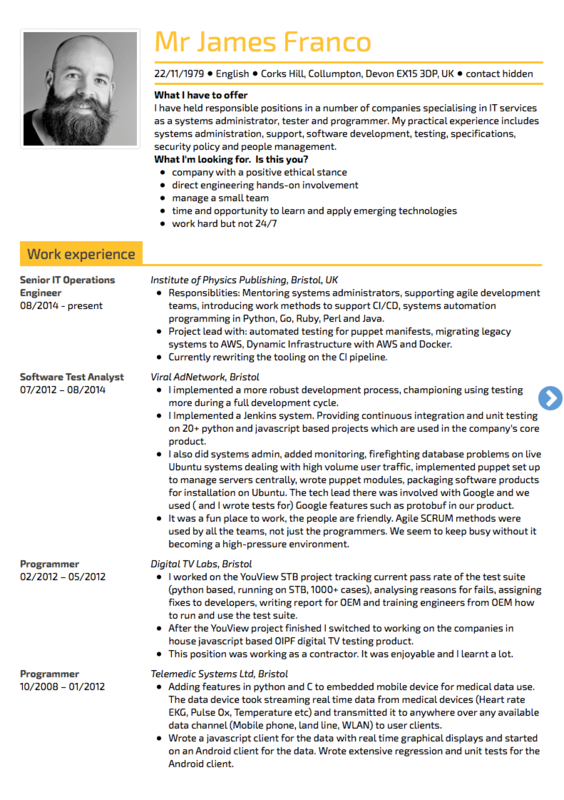 This is a fine example of how even a single page resume can help you snag a job at Google. You should put your achievements into numbers wherever possible. Use phrases like “increased by 10%”, “boosted by 12%”, or “improved from 70% to 88%” to prove that you’ve made a positive impact. The only thing that’s missing from the resume are dates of employment. This might be the result of an attempt to conceal larger employment gaps from the resume. Or just pure negligence of that final check. Are you a young professional with a short job history but some notable accomplishments? Emphasize them by creating a separate section of Achievements, making your success story speak for itself. The following resume also excels at utilizing horizontal eye movements of the F-shaped reading pattern. Using two columns, it manages to put all relevant information into a single page. 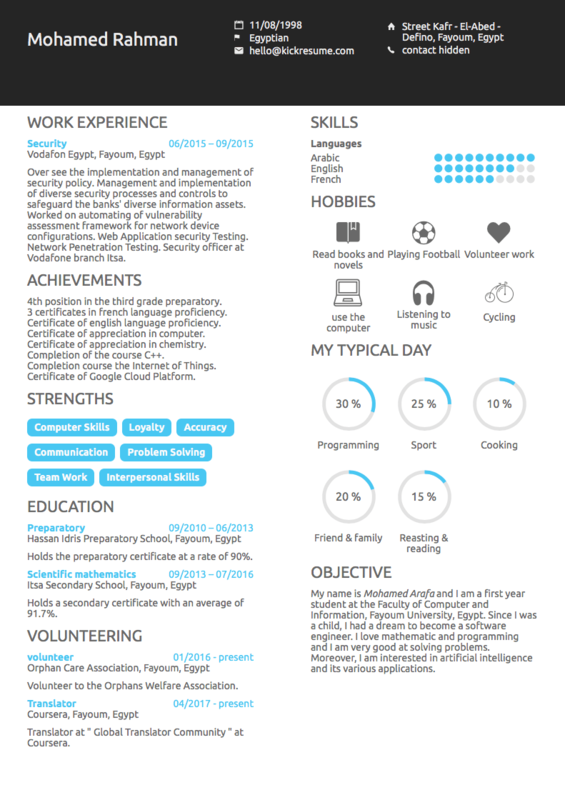 With the most important sections in the right place, it manages to pass the 6 second resume test with ease. Fresh graduates often struggle with their resumes because they feel embarrassed by the absence of work experience. But don’t despair, there are many other things that will make up for it. If you’ve been building up your skills in industry-relevant part-time jobs, don’t hesitate to include them in the Work experience section. Also, think about any voluntary work that you did during college. Do mention your extracurricular activities — like setting up a local sports promoting NGO — on your resume to portray yourself as an action-oriented individual that’s willing to cooperate. If you’ve completed any job-related courses or hold any relevant certifications, they need to appear on your resume. You need to show you weren’t idle during your job search and invested some time in developing your professional competencies in the meantime. 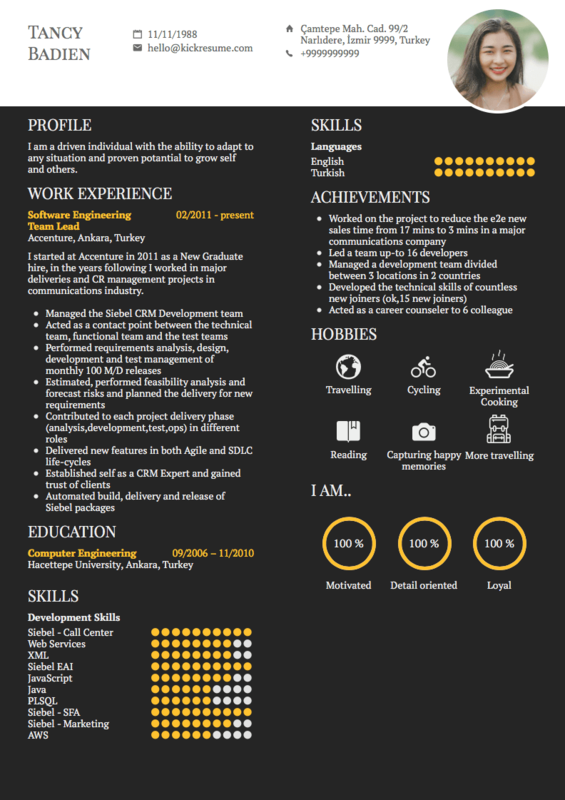 Also, it’s not a bad idea to get a bit creative with your resume to say things you want to say. Look at the way Mohamed chose to tell the company he devotes a large portion of his day to programming. Besides his love for computers, “My typical day” section also reveals a lot about his personal life and healthy work-life balance. 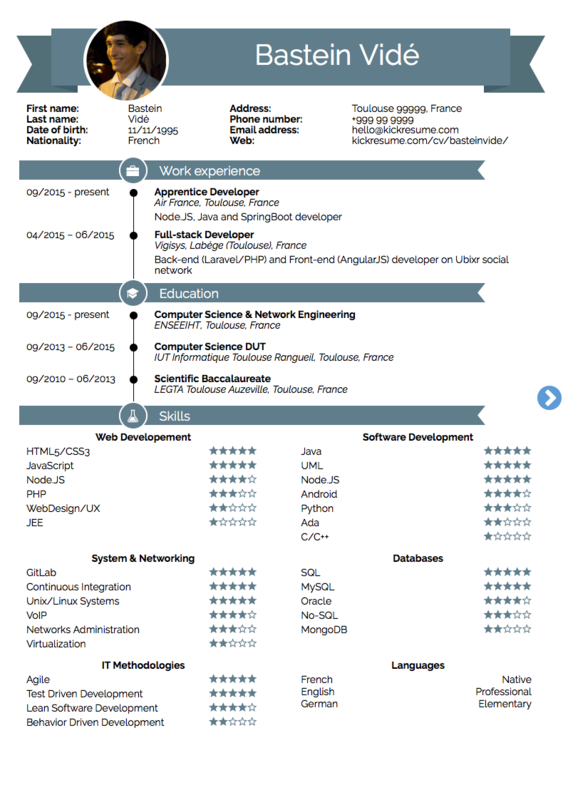 This three-page resume is hard to beat. It simply has it all — a powerful personal statement, extensive work experience with a numbered list of key responsibilities, honestly assessed programming and language skills, certifications with a date of completion. Although they are usually provided “upon request”, it’s good to prepare and obtain your professional references in advance. Try to get at least two of them — one by an academic referee and the other from one of your former employers. Remember that whatever your profile statement says needs to go hand in hand with the rest of your resume. If you choose to make any claims about your personality, make sure they are backed up by your actions. Caroline’s motto “if I don’t know something I will learn it” is a very fitting description of her steep career trajectory. Starting off as an intern, Carolina worked as a junior employee only to become a system administrator a few months later. And all of that during her studies! 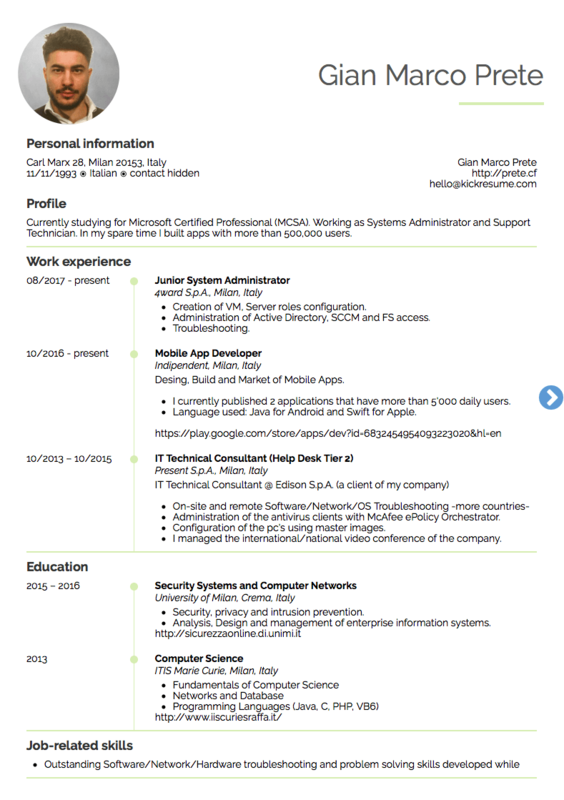 The last one of our IT resume examples proves how easy it is to use your resume to promote your portfolio. Most HR managers will review your resume online so make sure to link out to Google Play or App Store to make them see your products. Also, don’t forget to include websites of the companies that you worked for. Also, notice how the section of job-related skills introduces a variety of adjectives to describe the applicant’s abilities, doing away with dry facts and replacing them with juicy phrases instead. Still not enough? 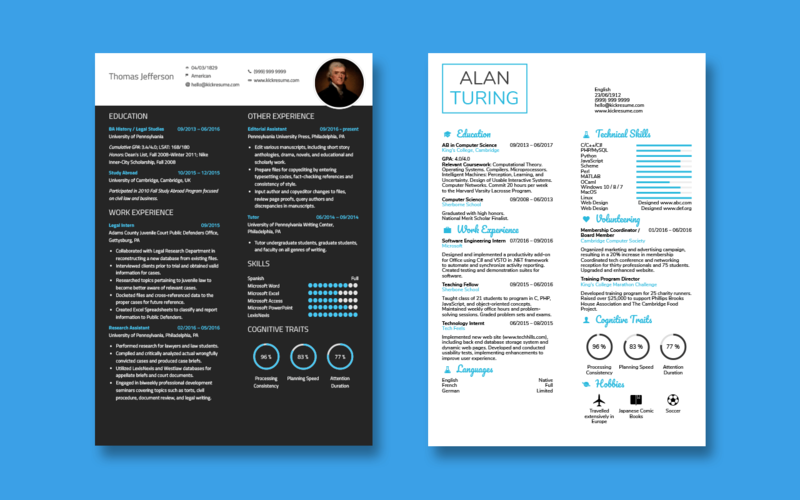 If you want to see more IT resume examples, check out our Resume Library!